Hills - Frid (Rocket Recordings) Signed to Rocket Recordings, home to many of the finest psychedelic noise makers out there at present, Gothenburg collective Hills alongside labelmates and fellow countrymen Goat have become a sizable cult proposition. 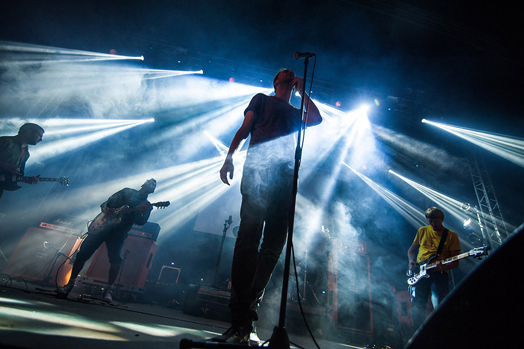 The band’s jaw-dropping set at Liverpool International Festival of Psychedelia in 2013 saw the group gather new converts for their nuanced, slow-burning tracks, the default setting vistas of repeated guitar motifs plaited with elements drawn from world music. Most apt headliner: Goat, whose vaguely pagan masked glory closed the final night of the Far Out stage and were followed by the ceremonial burning of the giant Green Man. Plus, "Run to Your Mama" might've been the best performance of the entire festival. We are excited to announce that Hills third album 'Frid' hits the shops today!! The first pressing of the LP comes with a poster that will not be available on any future pressings. The response for the album so far has been amazing...it has been awarded 'album of the week' by many shops and has received 10/10 and glowing reviews from all the websites/mags that have reviewed it!! Make sure you don't miss out on possibly the 'psych album of the year'! 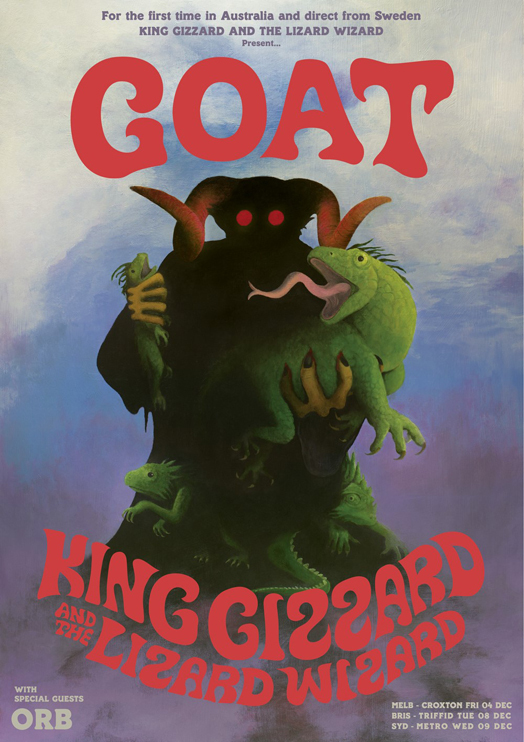 King Gizzard & The Lizard Wizard have announced a run of December co-headline shows with Swedish psych rockers Goat, who are headed to our shores for this year's Meredith Music Festival. These will be King Gizzard's first tour dates since headlining their very own festival, Gizzfest, back in April. The seven-strong Melbourne outfit have also spent a good part of the year charming audiences overseas and are currently in the middle of a US tour. They'll return home in time to support the November release of their seventh album in two years, the all-acoustic Paper Mâché Dream Balloon, hitting stages in Melbourne, Brisbane, and Sydney in early December alongside Goat. In a way that is reminiscent of fellow Swedes and label mates Goat, Hills play a primal psychedelia that draws from a far broader spectrum of sounds than the usual garage rock and motorik grooves of their British and American fellow travellers. 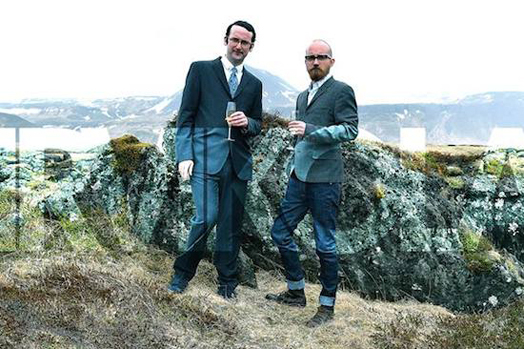 On Frid, their third album, vocals are largely put aside in favour of spaced-out instrumentals or chanting that suggests medieval plainsong fed into an effects box. While the guitar sounds and grooves of Tinariwen and Songhoy Blues rub up against the chemical drone of Spacemen 3 to make some serious pagan ritual music that both moves hips and flips wigs. The day after Hey Colossus's new album Radio Static High is released the band head to Bristol's Exchange for what looks to be a great night!! After the fourth listen of ‘Frid’, I found myself mentally extracting the drone from each of these tracks and most of the time the songs sounded as if they would still work. The exquisite guitar playing and eclectic instrumentation (I especially love the addition of the flute on ‘Milarepa’) shines through. Repeated listens though do not reveal an inner pop sensibility though. In fact you will be hard pressed to find a conventional hook anywhere on this record. Even ‘Death Will Find a Way’, which adds a vocal melody to its trippy arsenal, is downbeat and dirgy. Hills are not a band you hum to yourself in the shower. That’s for sure. With the drone in place though, this album rolls along like a thunder storm. It’s trippy certainly, but it’s a dark and threatening trip that doesn’t let up until the record has finished. They even have a song here called ‘National Drone’ as if they have mastered it and claimed the word as their own. Hills are the band I want Acid Mothers Temple to be when I listen to them. I like this a lot; it’s exciting. They appear focused on a goal and are sticking with it and no matter how bummed out you may be after the album’s 38 minute length you will want to take the trip again. Here's some great footage of Gnoomes performing Roadhouse from a sunny rooftop. This was recorded at the end of last year when the band were still a four piece so it is a different sounding version to the single, but still as good!! 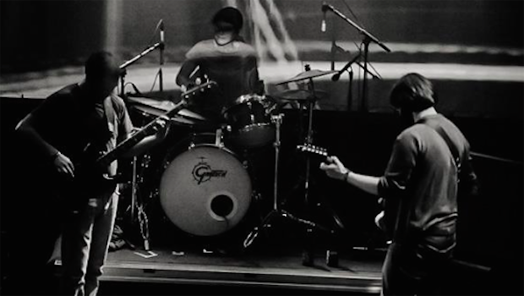 Hills exemplify a world music approach to psychedelic jamming. The accumulated musical knowledge of the core members, Pelle [guitar/vox], Hanna [drums], Bob [bass], Kalle [guitar], and Tore [organ/vox], coupled with a willingness to draft in a number of other musicians of various persuasions, contributes to an invigorating and heterogeneous sound. A sound emphasising that musical boundaries are being broken down, genre specification becoming irrelevant. 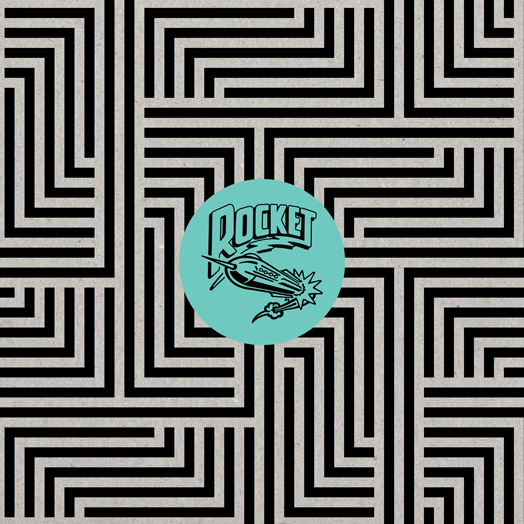 We are excited to announce a series of 'Rocket Shop Exclusive' EPs to be released in the latter half of 2015. They include brand new tracks from Italian band, 'Mamuthones', Brooklyn's finest 'Oneida' and the first music from 'Capra Informis', a new band put together by the unnamed djembi player from Goat. The first EP to be launched is the 'Mamuthones' record to coincide with their appearance at the up-and-coming Liverpool International Festival of Psychedelia in September. 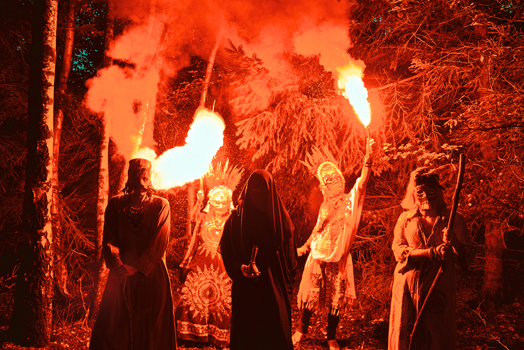 Mamuthones take their name from the death-masked incarnations that have walked the processions and haunted the imaginations of the Sardinian locals in the traditions of their carnivals for centuries, and they emerged initially from the Italian occult psychedelia movement. Yet in keeping with the celebratory origins of their moniker, this band - originally formed by ex-Jennifer Gentle (Sub Pop) seer Alessio Gastaldello - are possessed of an upbeat and effervescent sound that’s equal parts riot and ritual. It’s one that’s seen them make waves around the globe, first striking out on Rocket Recordings with the ‘Collisions 04’ split release with Evil Blizzard last year, and their new 12” Symphony For The Devil - which only serves to further guide their spectral magick towards the dance floor. Perhaps recognising that the Rolling Stones original is in need of desecration more than reverence, the lead track is a spectacular and sacrilegious reinvention, filtering their avant-garage sensibility through a kosmische-disco prism to arrive at something akin to a deviant marriage between the electro-charge of LCD Soundsystem and the elegiac lysergia of Spacemen 3’s ‘Big City’. 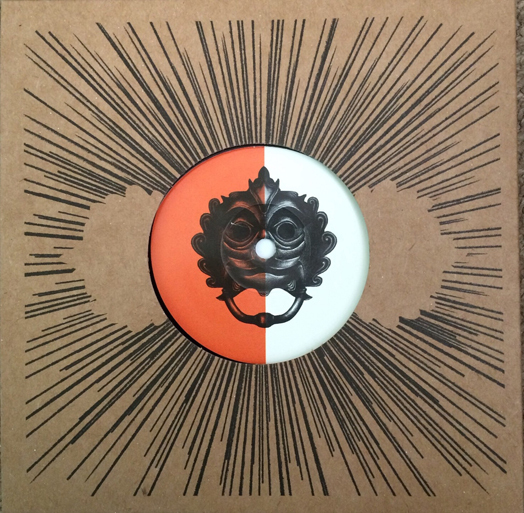 What’s more, an imposing remix by Howling Owl artists and Bristol’s new kings of noise, Giant Swan (also playing at Liverpool Psych Fest) twists it anew into a drone-based vortex of dub echo and Liars-esque nihilism. Meanwhile, ‘Any Longer’ (from the sessions that produced the ‘Collisions’ material) throws us back into guitar-drenched monomania, tapping gloriously into the ley-lineage of ‘Monster Movie’ and ‘Live At The Witch Trials’ before being disassembled in another remix by Italian dance maestro Lucretio, who also contributes a remix of ‘Symphony For The Devil’ available exclusively to the digital edition of the EP. This barnstorming EP catches the mercurial Mamuthones using their genre-transcending vision and hedonistic intensity to create something primal and potent, mischievous and malevolent. Frankly, Liverpool isn’t going to know what’s hit them. All three and future EPs will only be available via Rocket's online shop here or from the bands direct, but can be bought digitally from all the usual outlets. More information to follow on the other two releases in the up-and-coming months - watch this space! 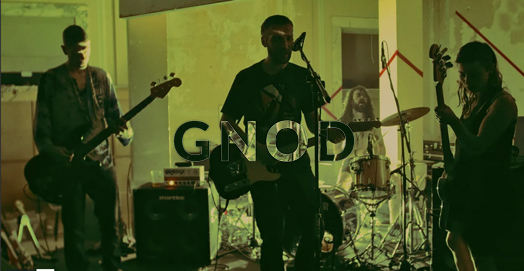 Gnod are back in London this Friday. 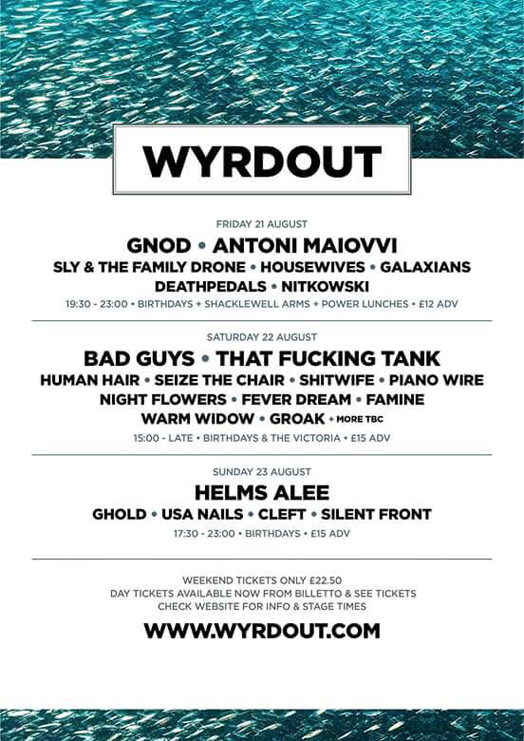 They are playing the Wyrdout Festival in multi venues around Dalston. 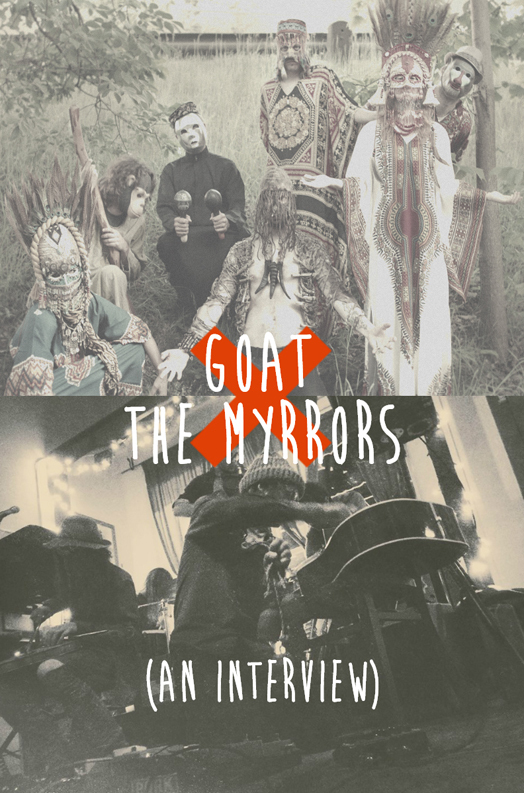 Sweden’s Goat and Arizona’s The Myrrors might be based on opposite sides of the globe, but these genre-defying bands have much in common. 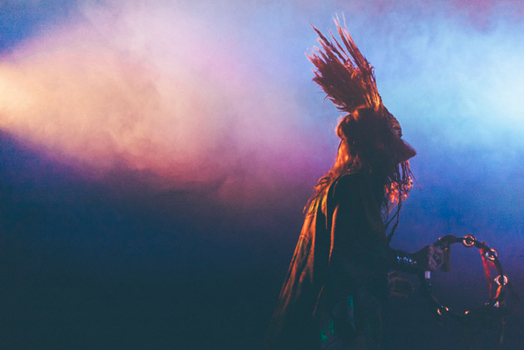 Both share a passion for vintage and contemporary ethnic, experimental, and avante garde music and filter these influences to create their own distinctive sound. Both seek the mystery of inspiration found in improvisation that — when the planets align — elevates their music to transcendental heights. 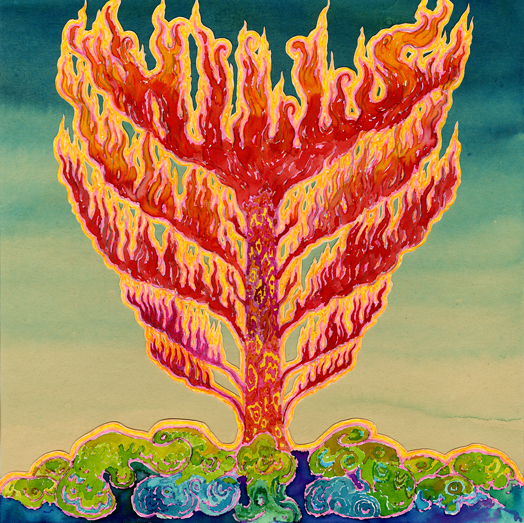 So when I discovered through various interviews that both bands enjoy and respect each other’s work (and with The Myrrors embarking on a European tour with some dates in Gothenburg as well as at the Copenhagen Psych Fest this November) I thought it would be cool to put The Myrrors and Goat together. 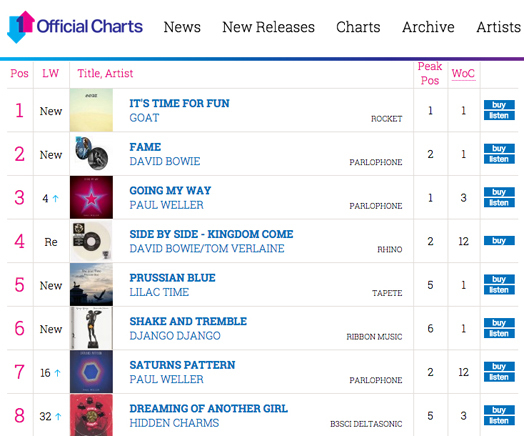 We are chuffed to announce that Goat's single 'It's Time for Fun' went to Number 1 in the Official UK singles chart!! It is a ltd 7" single, so that probably means there aren't many copies left, so if you don't have one better buy one now. LIVE! Musiche di Sconfine 2015 - Lay LLamas from DobiaLab on Vimeo. There is always going to be a nagging concern that a much anticipated follow-up to a landmark debut is going to fall flat. Gone are the days when a band would put out a tentative range finder, build on it and then struggle with the prospect of the difficult third album. Nowadays (hark at him) the debut is often so rehearsed and finely honed that the sophomore is onto a hiding to nothing. Don’t believe me? Then take a while to think of the number of vaunted hotshots who have come veritable croppers trying to match let alone top their opening salvo. Verily, the road to bargain bin hell is littered with New Dylans and biggest things since the Beatles. 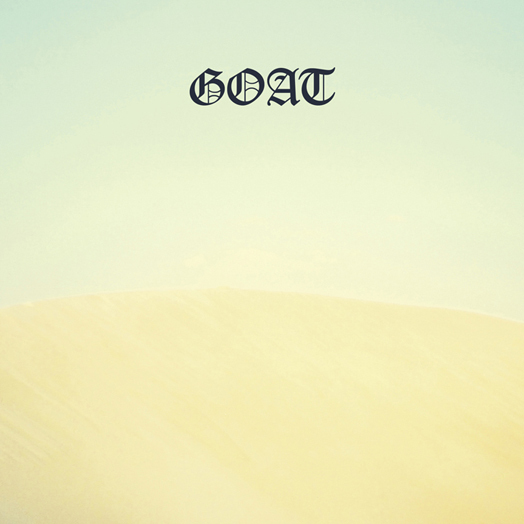 Goat are the definition of a culture clash, but their combination of African guitars and psychedelic vocals comforts, rather than confuses. 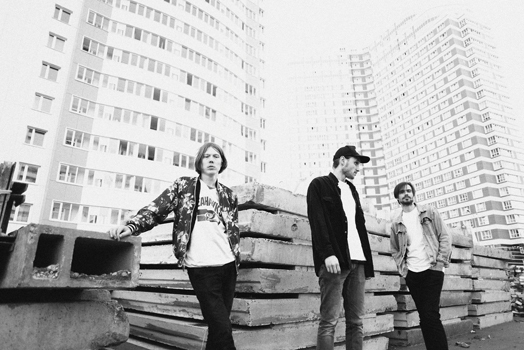 Their sound is so unusual that you have to hear it to believe it and their new single, ‘It’s Time for Fun’, is certainly an example of everything Goat can offer. The song starts with a simple guitar rhythm, which morphs into a mild 60s style beat. By the time the vocals kick in, the songs builds from mild to spicy, until the extra-hot, wild scream that comes with the climax of the song. If the song was food, it would have whizzed up the spice-meter in only four minutes and it most definitely leaves you with a pleasant tingling in your ears. Here is another track off the forthcoming Hills album Frid. It is the first track on the album and is called Kollektiv. The album is released in all good shops on LP / CD / DL on 28th August 2015. All first pressings of the vinyl come with an A2 poster. 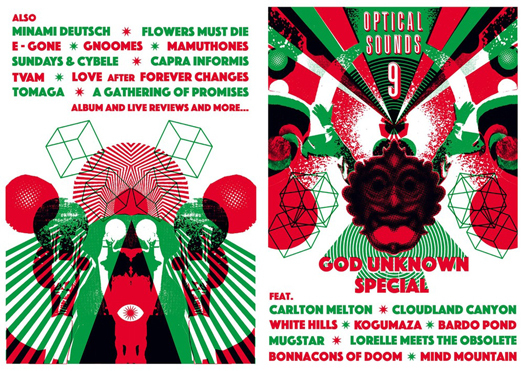 As you know, we are MASSIVE fans of the magazine Optical Sounds and their next issue is up for presales and it features lot's exclusive interviews with many Rocket bands. Includes and exclusive brain frying God Unknown 7" by Bonnacons of Doom. Awesome optical interference artwork by Nick Taylor. All 64 pages printed in Risographic Ink. Another God Unknown 7" and another Rocket band!!! It is an amazing brand new track called Numbered Out! A 'different; version of the track appears on their recently announced new album 'Radio Static High' which is out in October. So you need to get both versions!!! These Gothenburg psych-rockers trudge, sleepy-eyed, out of the mist with their third album, before locking down and wailing in a manner both grimly portentous and sonorously cathartic. The blissed-out Anukthal Is Here is a highlight – beginning with the solemn air of a funeral procession, it suddenly bursts into undulating guitar explorations and flute passages dripping with folk-flavoured mysticism. Marvellous. Eastern tones and hypnotic drones abound – all par for the course in Hills’ chosen genre – but when they bust out ten-minute jam Och Solen Sänkte Sig Röd, everything comes together in spectacular fashion. Guitars weave in and out of a pulsating bass groove; stabbing, fluttering and flailing; while solemn vocal intonations punctuate a growing sense of wide-eyed wonder with curiously absorbing detachment. Ultimately you’ll get as much out of Frid as you’re willing to put in – may as well throw your whole consciousness into its moody, murky magnificence. 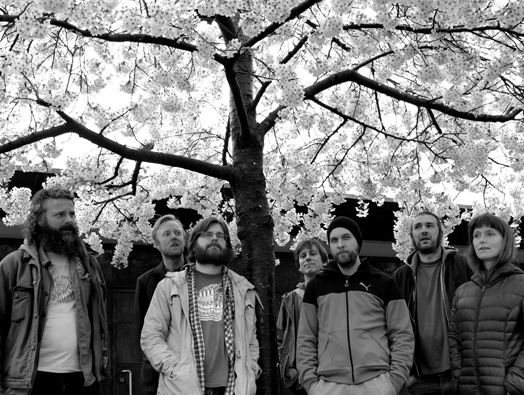 Goat return to Gothenburg's great music festival Way Out West this weekend!! Then it is only one week until Goat headline the Far Out Stage at Green Man Festival! Goat return for their first new release since last year’s superb Commune and it’s as raw as ever. Recorded in NYC, the A-side shares some of that downtown grit, a restrained, hypnotic groove for covering yourself in glitter and feathers and wigging out in a field. With ‘Relax’ as the dreamy, Saharan antidote on the flip, this limited 7” may be compact but it does the job and gets out of there in a little over eight minutes flat. Not content in releasing one career defining album this year, Hey Colossus have gone and created another!! 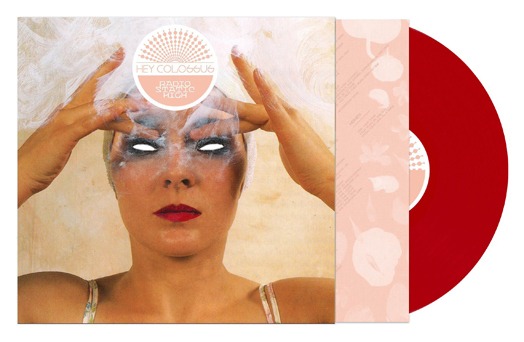 'Radio Static High' is the new album from Hey Colossus and all we can proudly say that it is their best ever album. Listen to 'Hop the Railings' from the album above. Initially lurching from the UK noise underground in 2003 like a bedraggled audial creature rendered from toxic waste in a VHS horror movie, the musical growth rate of Hey Colossus has been quite a spectacle to observe. Yet from the nightmarish murk of early driller-killer works such as 2004’s debut ‘Hates You’ and 2008’s ‘Happy Birthday’ to more recent nuggets of perversity like 2013’s ‘Cuckoo Live Life Like Cuckoo’, this beast has mutated and evolved into something uncommonly alluring. 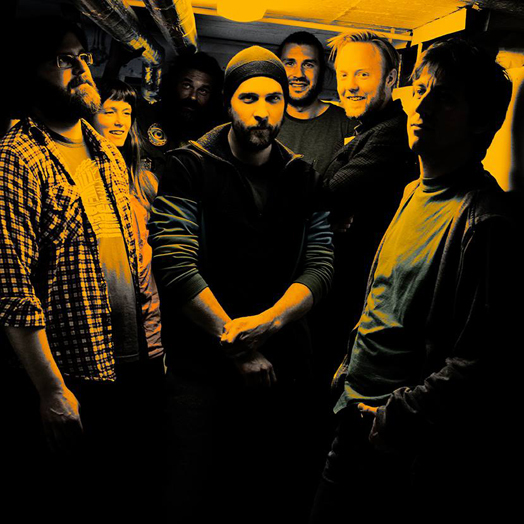 The six-piece London-via-Somerset troupe began 2015 with February’s release of ‘In Black And Gold’ - in which the brawny repetition-driven raunch they built their sound on was furnished and burnished by dub-derived spatial awareness and cinematic drama, making it both a bold reinvention and an uncommonly compulsive avant-rock document. Yet not content with this, the band immediately set about following it up with their second album of the year, and one that further ups the ante on their savagely graceful assault. ‘Radio Static High’ is the sound of a confident outfit honing their attack to become a veritable force of nature. With the band citing - tongue presumably firmly lodged in cheek - inspirations as diverse as Jane’s Addiction, Fleetwood Mac (Tango In The Night era) and Cypress Hill, songs were constructed at a fierce rate of knots, yet with a focus and intensity partly instilled by band members living hundreds of miles apart, and partly by the relentless passage of time. “We have noticed a small wave of incredible goodwill towards us. We want to give as we receive.” notes guitarist Jonathan Richards, whose chiming lead guitar plays a notable role in the album’s Paris, Texas-esque midday ambience..”Maybe the knowledge of our 12 years together makes us aware of our mortality. Time is limited. A band’s purpose is to create”. Songs took shape from demos, exchanged riffs and drunken text messages alike -one such from guitarist Bob Davis to Richards demanding an homage to Neil Young’s ‘Cortez The Killer’ resulted in a demo to that effect a mere 20 minutes later. which eventually became album centrepiece ‘Memories Of Wonder’. 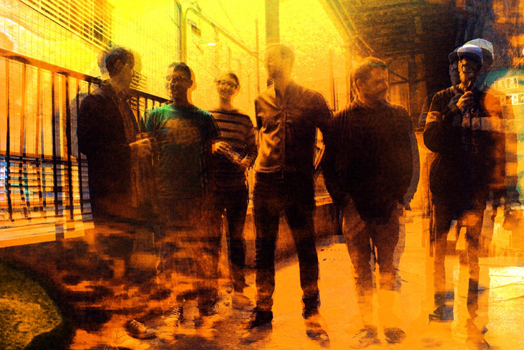 Elsewhere, ‘Hop The Railings’ takes the powerfully propulsive groove of Can and cross-pollinates it with Beefheartian interweaving triple-guitar skronk to make a heat-haze-dwelling juggernaut of intimidating proportions, whilst the closing double-drop of ‘Hesitation Time’ and “Honey’ hits like Joy Division repurposed for the soundtrack to True Detective. “After 12 years functioning in a Noiserock/Doom/Kraut/whatever scene of sorts and being aware of unwanted repetition, we feel it is more subversive for us to compose songs with rigid song structures than it is to absentmindedly clang off another riff-athon.” Richards adds. 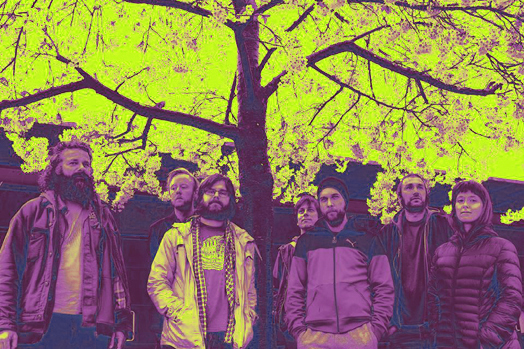 Indeed, with all the bulldozing primal drive of heavy AmRep-style rock and none of the cliches, and a sound infused with leftfield sleight-of-hand yet hitting home like hammer to anvil, Hey Colossus prove themselves as potent as they are prolific. What’s more, ’Radio Static High’, in all its sunkissed widescreen glory, is set to leave most all their contemporaries eating their dust. 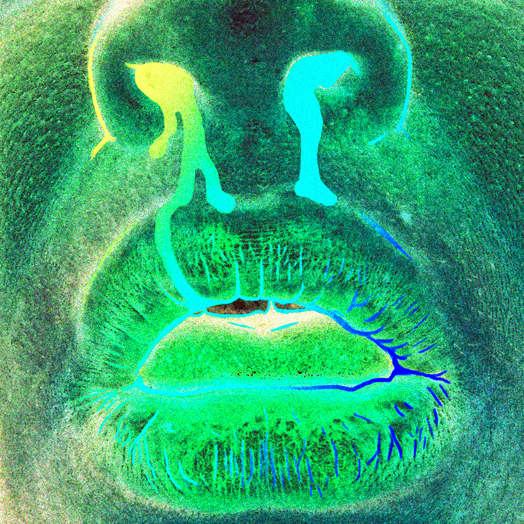 We announced the debut album by new Rocket band Gnoomes last week. Their debut album 'Ngan!' is released on the 16th October and you can hear (and Edit of) the first track 'Roadhouse' above. After last year’s Master Sleeps album and a defining set at Liverpool Psych Fest, Hills have a lot riding on this new album Frid and with label-mates Goat making waves in even bigger circles it’s not too much of a leap to see them joining them soon. If there is any hope in this world then this will happen and if it does then Frid will be the perfect album to introduce this quite magnificent band to a wider audience. 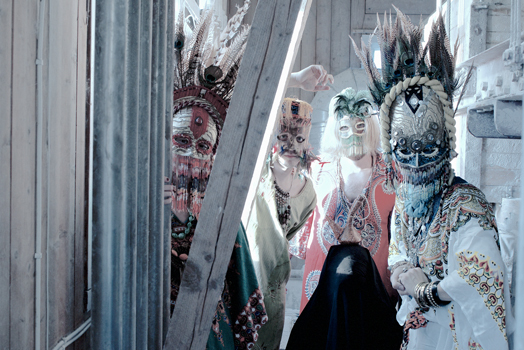 Frid is the new album from Swedish psychadelianauts Hills and is the follow up to 2011’s Master Sleeps. The winter months following the release of Commune saw the band return to their village of Korpilombolo in Sweden to start anew on fresh material, and this two-track single collects the first fruits of this work. However, these two songs were not recorded in their native land - instead Goat decided to hit the studio on a recent excursion to the Americas. The A-side ‘It’s Time For Fun’ was recorded in New York, whilst B-side ‘Relax’ was committed to posterity in Sao Paolo. New York seems a fitting location for the recording of ‘It’s Time For Fun’ as the spirit of ESG and early ‘80s No Wave runs through the skittering drum machines, dubby basslines, fuzzy synth and the haunted chants of the vocals. Its flip-side ‘Relax’ mainlines a similar vibe, yet this reflective instrumental marries ‘Future Days’ like drum machine, tribal percussion, grooved-out bass and a fan-driven organ solo that gyrates elegantly in a manner akin to a North African Heldon or Fripp & Eno. West coast of southern Sweden, on the delta of the river Gˆta. Here it was created the main junction for the trading and the cultural exchange of the Germanic tribe of Gutar with the rest of the known world. Here takes shape Gˆteborg where today born inebriating flakes of supernatural noises fainted into a fiery mass of impulses and screeching, corrugated metals, altered genius. Psych-prog flowing like a cosmic dust. Hills music. Not by chance the geographical position plays an important function in the artistic genesis. A fundamental access to appropriate the new knowledge, traffics, thoughts, different hemispheres, notions of another knowledge. The relationships between western philosophy and oriental spirit are ancient theme. Wherein probably, the best way to face it is the connection between the study and the development of romantic-hindustani dictates, as it can foresee from the notes of "Frid". Listen and lose oneself in this fourth album of Hills represents a travel beyond the mind boundaries, wedge oneself through dimensionless specifications, through miasmatic nourishments deserving of a stellar mastery. A mixture in which the influences are multiple and where the expansion of the talent, is closer to art-rock themes, able to summon a much wider number of listeners. Compared with the elements of first recordings, especially the beautiful 'Master Sleeps', we find the same womb cloned by kraut Can style or the endless 'west coast' sparks transformed in acid-space by Wooden Ships structures. But particularly an alive indo-european breath, full of folk with charm and chaos mixtures, a classic of middle east lands. After the legendary performance at Liverpool Psych Fest in 2014 the creative path restarts. The statement into the EP "Psych For Sore Eyes vol.2", the same year, to recreate even the features and the best moments in the experimentation of the minstrel Ian Anderson, an awesome buzz concentrated by a wild ride full of a vitriolic and enchanted fire. Indeed, 'Montelius V‰g' was frenzied movement joined to aesthetic and spiritual concepts. The new album "Frid" seems to an infinite impressionistic 'Sister Ray' with the sitar and the flute that replace the John Cale viola, in which the arteries pump cosmic flows with swirling repetitiveness, devastating guitar solos delivered by a trance-fuzz at the limit of the mediumistic, aesthetic of obsession and impulsiveness produced by the incessant repetition of drones and sonic oscillations. Six titles, six defaced pictures, where seems vibrates a knife derived by Paul Whitehead to recreate the contrast of pastoral climate with the more violent and internal one. 'Kollektiv' seems the manifesto that introduces any reference to inflections sixties that are linked with the artwork album for an interesting correlation to 'Sov Gott Rose-Marie' of the legendaries swedish progsters International Harvester, then became Harvester and at last Tr‰d Gr‰s Och Stenar. 'Drone National' immerses itinerants scents of psychedelic lineage, the sitar mixes oriental lines and marvels astrals. Hypnotism, mystical syllables and constant oscillation. Fluctuating keyboards and superhuman lyricisms draw 'Anukthal Is Here', religious contemplation of airy chords until that the electric spirit possess the soul. A jewel, a carpet of pure silk interweaved by celestial hands. Tibetan Buddhism in 'Milarepa': wizard, poet, religious. The flute looks like a spell to get rid of the presence of multiform demons, beneficial doctrines, lonely meditations. Tuckerian percussions and hourglass drums. Vehicle or instrument of thought or of thinking, here is the westernized ecstasy of 'Och Solen Sankte Sig Rod', an endless narcosis between terracotta tubblaa, cymbals, swirling bass, the guitar scratch seems to whisper like an infernal bansuri until that the inextinguishable faith brings it back to the way of light. Atavic wah wah and overshadowed litany, time is coming: 'Death Will Find A Way' is an exalted singing where the sound takes on an idyl and the poison becomes a tinsel. "Frid", peace. The creative journey symbolizes another time the way to accomplish to arrive to the higher stages of the interiority that takes to liberation. Hills aspire to go over the complexity of what they express. 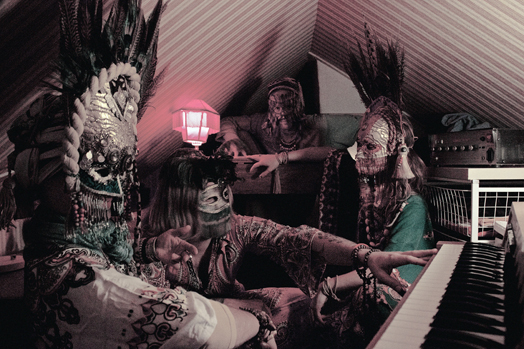 Under an egis of musical genres that include progressive, ethno, psych and a further diffusion of heavy pills into dark power, they experiment a continuous improvisation and connect the universe without boundaries, the indistinct of the figure and the infinite of awareness. 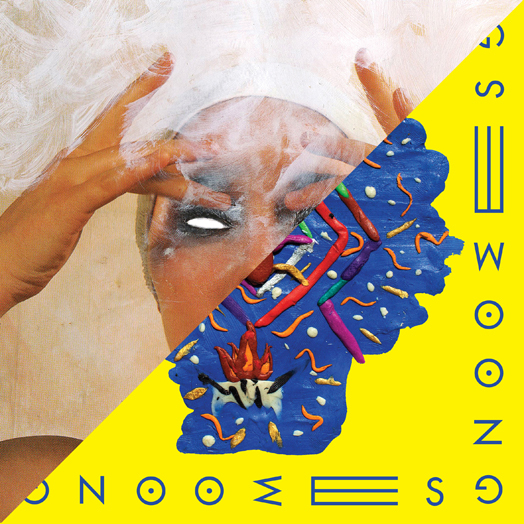 Gnoomes, our latest signing who's debut album Ngan! we announced a couple of days ago have their first show as a Rocket band!! 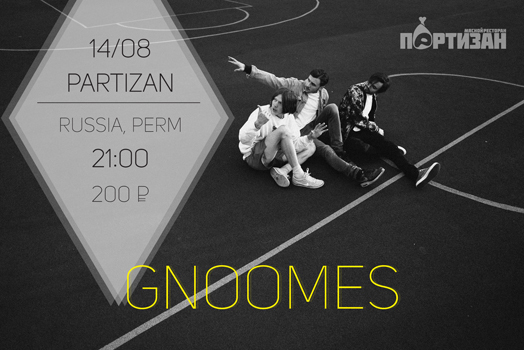 They play Partizan in their home city of Perm in Russia on 14 August. 26/9/15 – Liverpool Psych Fest. 01/10/15 – Brighton (W/Lower Slaughter + Roy&The Devils Motorcycle). 09/10/15 – London (W/Kogumaza + Lower Slaughter).